Since the program was founded in 2004, the Robert Morris men’s hockey team has had just one coach. Derek Schooley will enter his 15th season as the Colonials’ bench boss this fall, and stability has been one of the core facets of his tenure. Despite the Colonials being one of the new kids on the block in Atlantic Hockey (only RIT, which joined a year later, is newer to Division I), Schooley is the conference’s fourth-longest-tenured head coach. The team’s results on the ice have been just as consistent as his presence. Since Robert Morris joined Atlantic Hockey in 2010, the Colonials have finished at or above .500 and qualified for postseason play every year. In each of the last five years, they’ve finished no worse than in the conference tournament’s semifinals. In that span, they’ve won two Three Rivers Classic Confluence Cups, two AHC regular season titles and one AHC Tournament title. Individually, the team has had a succession of long-tenured athletes that have racked up impressive statistical totals. 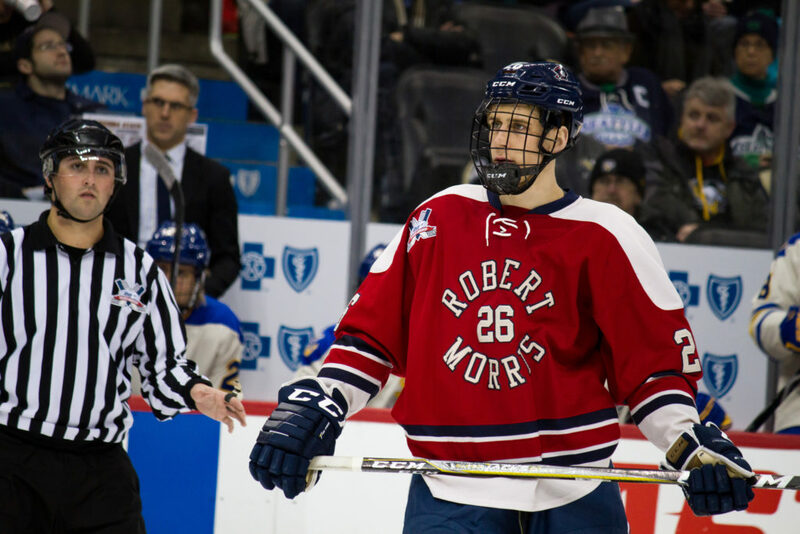 In three of the last four years, the Colonials had a player set the school’s all-time points record, with Cody Wydo in 2015, Zac Lynch in 2016 and Brady Ferguson in 2018. The program is generally considered to be in a pretty good place halfway through its second decade, and that’s why the news this summer that three players — forwards Matthew Graham, Kevin Lavoie and Ryley Risling — were all leaving the program with eligibility on the table, was surprising. Like any college program, Schooley and the Colonials have seen a normal level of attrition over the years. Defenseman John Rey turned pro midway though his senior season in 2016-17, at the same time freshman Chris Schutz transferred to UMass-Lowell. In the summer of 2016, winger Kyle Eastman decided to hang up the skates. Jay Llewellyn had done the same the summer before. But three players leaving in the same summer? It seemed as if something was up, but Schooley said to Pittsburgh Hockey Digest that it was just a matter of circumstance for all three players. Right after the end of last season, Lavoie expressed to Schooley a desire to find more playing time after being a healthy scratch most of his sophomore year. Later this summer, Risling decided to return to Canada, unsure of whether or not he wants to continue to play high-level hockey. Graham, the most talented and experienced of the three departures, had locked down a top-nine right-wing role over his first two seasons, but hadn’t quite produced at a level on the stat sheet equivalent to his talent level. Of the Colonials that had the opportunity to take a big step forward over the next two seasons, he was probably toward the top of the list. But family issues called Graham closer to his Nova Scotia home, and he’ll play college hockey in his home province while giving up his dream of playing Division I to be closer to his family. “He made a mature decision to go home to be closer to his family and we wish him well,” Schooley said. While each of the decisions were made separately and for different reasons over the last five months, the totality of the summer’s moves have left the Colonials a bit thin on experienced depth at forward. Seniors Michael Louria and Alex Tonge and juniors Jacob Coleman, Daniel Mantenuto and Luke Lynch will be expected to provide the bulk of the scoring, but that will leave plenty of room for newcomers to scoring-line roles, whether it’s a stellar senior season from Kyle Horsman or Brandon Watt, progression from rising sophomore Nick Prkusic or contributions from some of the 11 incoming freshmen. “We’re going to be mixing and matching a bunch of freshmen in the lineup and I think some of them are going to be top-six, top-nine forwards,” Schooley said. Two-time CCHL 30-goal scorer Nick Lalonde, 60-point NAHL scorer Kip Hoffman and 54-point USHL scorer Grant Hebert are all prime contenders to emerge as early offensive threats. It will be the second time in three years that Colonials will bring in a 10-man or larger freshmen class. The last time around, the burgeoning class headlined by locals Coleman and Lynch and now two-year starting goaltender Francis Marotte was shepherded along by the strong leadership of then-captain Rob Mann. Schooley doesn’t yet have a leadership structure in place for the upcoming season, but the ability to bring along the big group of first-year talent will be a big part of the job. If they can find that leadership, and another large freshman class produces another wave of talent, the stability that’s been the hallmark of the program shouldn’t skip a beat.